Venture to the birthplace of Western civilization and immerse yourself in the history, culture, and luxury of the Greek isles. Heeding the words of the ancient Greek philosopher Euripides that “experiences, travel—these are an education in themselves,” our family journeyed to Greece to explore her capital and revel in her islands. Hotel Grande Bretagne, the grand dame of the Grecian capital Athens, is an ideal base for history-minded travelers. Since 1874, nearly every major political, social, and economic event shaping modern Greece has been part of the hotel’s history. Its amenities—ranging from a rooftop restaurant with magnificent views of the Parthenon to an opulent spa—will delight travelers with a taste for luxury. 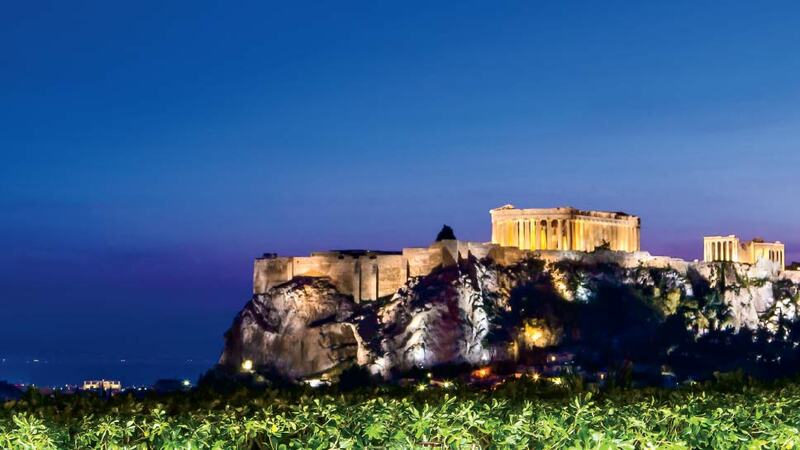 Located on Syntagma Square, the hotel is just steps away from the city’s finest shopping, entertainment, and culture. Although the streets around Hotel Grande Bretagne swirl with activity, the well-insulated rooms are whisper quiet—perfect for restorative sleep. A guided city tour is a wonderful way to explore Athens—a sometimes chaotic but always exciting juxtaposition of the ancient and modern worlds. Hotel Grande Bretagne’s efficient and friendly concierge arranged our tour of Athens’ important landmarks. Crossing Syntagma Square, we first visited the Greek Parliament and then the Monument of the Unknown Soldier, where we watched the changing of the guards whose uniforms are based on 19th century Grecian costumes. It is no wonder these soldiers are called Evzones, meaning “well dressed.” Then it was off to the National Garden, the Temple of Zeus, where a huge expanse of columns made for an excellent photo op, and the famed Hadrian’s Arch. After a winding trek through the Plaka, Athens’ oldest section, we found ourselves at the foot of the sacred Acropolis—a rock of hard crystalline limestone rising from the soil to a height of 500 feet above sea level. As the Acropolis is completely isolated and only accessible from the western side, we marveled at how the ancient Greeks had erected such immense temples on this outcropping. As we ascended the hill, breathtaking views of the city unfolded. Our guide regaled us with tales of the past as we walked around the Nike Temple, Parthenon, and Erechtheion, the ancient temple dedicated to Athena and Poseidon. Bloody battles were a too recurrent motif in these tales; it was heartbreaking to think of all that has been destroyed or stolen over the last 2,500 years. Following our descent from the Acropolis and a stroll through the Ancient Agora or public marketplace, we visited the National Museum where treasures from the Parthenon are housed and ancient ruins showcased under glass floors. This museum’s carefully curated journey of Athens’ past provided an uplifting reminder of just how much history has been preserved. After a full day of sightseeing, we often headed to the Kolonaki neighborhood for an authentic Greek meal or ice cream. While many guidebooks describe the Plaka neighborhood as the “real” Athens, we found it very touristy and preferred Kolonaki—an area we fondly dubbed the Lincoln Park of Athens. At the end of each day, we visited the hotel’s award-winning Grande Bretagne Spa for a luxurious water journey. 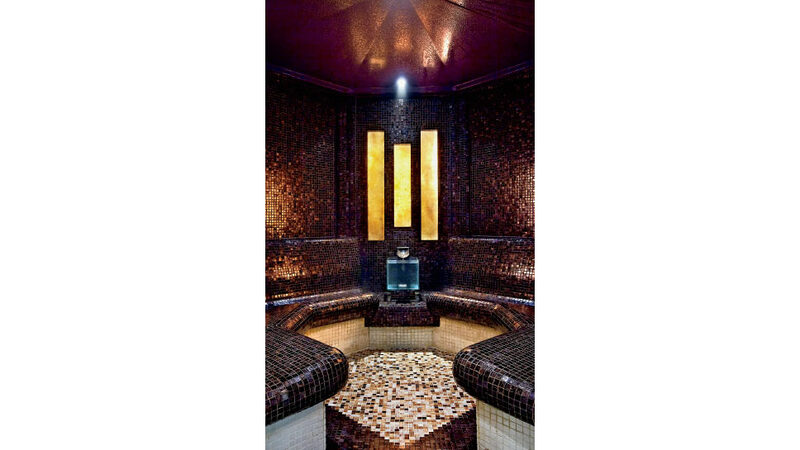 Moving from herbal steam rooms to an amethyst grotto to the beautifully tiled Laconium, we enjoyed treatments ranging from invigorating ice scrubs to dry saunas to reflexology bathing pools for tired feet. After these lovely experiences, we would float in the spa’s pool counting our blessings under an intricate ceiling. 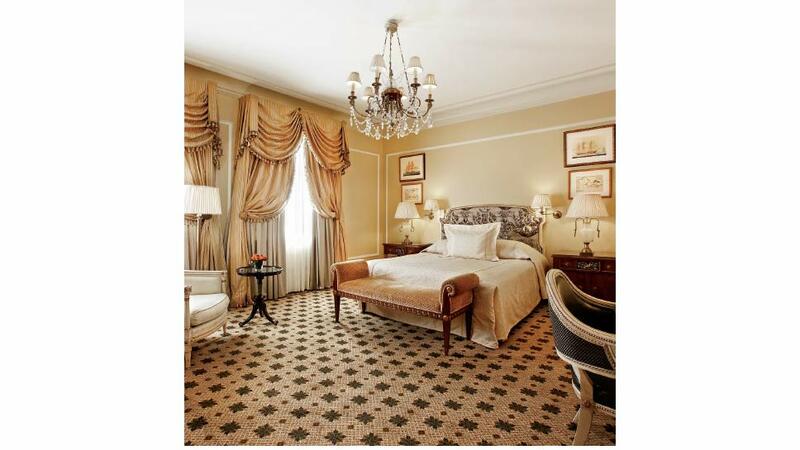 Is it wrong to admit the Hotel Grande Bretagne was my favorite place in Athens? After a few days in big city Athens, we heeded the siren call of the Grecian islands and journeyed to Santorini. Commonly referred to as the “supermodel” of the Greek islands, this head turner is internationally recognized for her soaring white cliffs, blue-domed churches, and pristine views. Santorini’s exquisite beauty has earned it a spot on many a bucket list. July and August can be especially crowded. If you wish to avoid the masses, a trip during the cooler months is highly recommended. Although the water might be too chilly for swimming, the views are magnificent 365 days a year. You can arrive on this magical island via ferry or plane. We chose the quick flight and arranged for a car to meet us. The ride to Oia, located on the island’s north end, was exhilarating as our driver spun along the windy cliff-hugging roads. 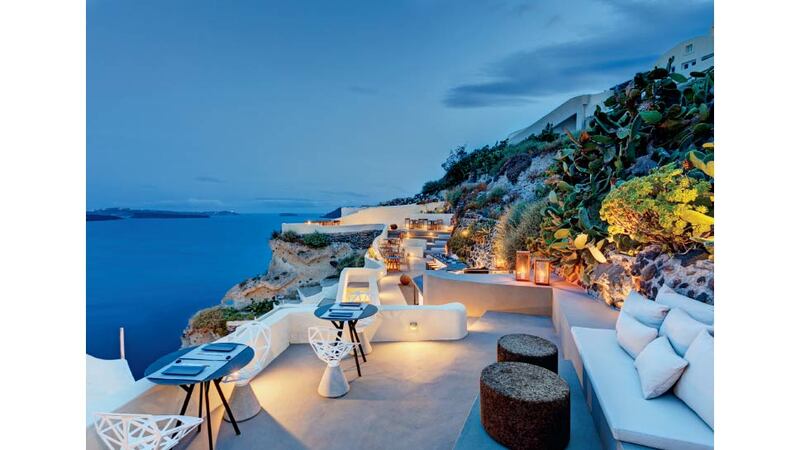 I have two recommendations for your stay, The Ivory Suite or one of the Allure suites at Mystique (a Luxury Collection hotel); both are located in Oia. The Ivory Suite rests just up from Mystique’s reception area and both are carved into the rugged Caldera cliffs offering gasp-inducing views of the Aegean Sea’s turquoise waters. The suites boast whitewashed curves that effortlessly combine the traditional Santorini architecture with carefully placed contemporary accents—creating a unique feeling of nature but at the same time, unabashed luxury and elegance. Both are cave-style suites consisting of one spacious bedroom with a king size bed and an open living space. Private balconies provide panoramic views from comfortable sun loungers as well as a dining area. A fun element to the suites is an outsized indoor Jacuzzi with unobstructed views of the sea. If you are looking for a getaway with your spouse or significant other, visit one of Mystiques’ Allure suites; if you are traveling with children, try The Ivory Suite. Resisting the serious temptation to lounge on our patio all day, we decided to explore Santorini’s famous black sand beach. We found cars were inexpensive to rent and were happy to discover there was only one main road, narrowing our chances of getting lost. After dipping our toes in the sea, we stopped by one of the island’s many vineyards to admire their unique way of growing grapevines—vines are woven into baskets to protect the grapes from the elements—and to sample the local varietals. The island offers many attractions for the adventure-seeking and water-loving traveler. The famous six-mile hike between Oia and Fira guides one through small villages and past isolated churches while never losing sight of the startling blue waters and expansive sky. Another favorite excursion is a daylong catamaran tour of the Caldera, a flooded volcanic crater, with stops to swim and snorkel. Whatever adventure you pursue, Mystique provides two wonderful restaurants from which to relive memories with a glass of Vinsanto in hand. Charisma, an open-air restaurant perched on the edge of a cliff serves a Mediterranean menu while Mystique’s ASEA Restaurant and Lounge offers delicious sushi in a casual setting. Spend your final night as we did, gazing at the sun as it dips into the deep blue sea and toasting all you have learned and seen. 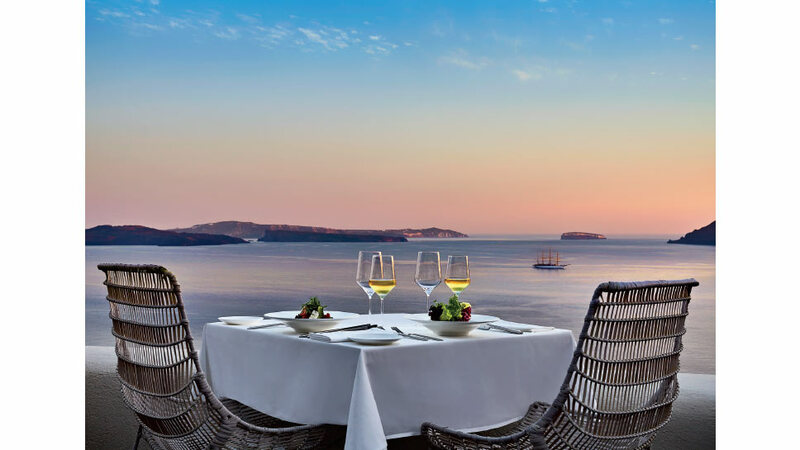 For more information about Hotel Grande Bretagne, visit grandebretagne.gr; Mystique Hotel Santorini, visit mystique.gr; the Ivory Suite, visit ivorysuitesantorini.gr.